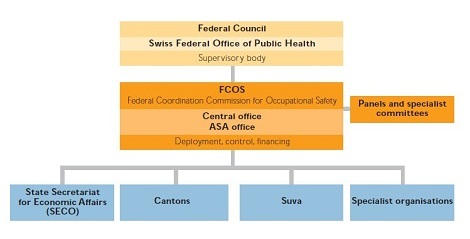 The Federal Coordination Commission for Occupational Safety FCOS is the central information and coordination office for safety and health at work. It coordinates the preventive measures, the tasks in the execution and the uniform application of the rules. Their decisions are binding. To answer this question and make the FCOS known, the electronic self-portrait of FCOS (FCOS 6235) was developed. When FCOS the prevention of occupa-tional accidents and diseases is the focus. In its accompanying statement to the accident insurance law, the Federal Council defines FCOS  the Federal Coordination Commission for Occupational Safety  as the actual central agency. «Executive organs»  as they are called - are not only responsible for the supervision of regulation implementation in the field of occupational safety but also for giving important advice to companies. In the first instance, the cantons and Suva are charged with advising and monitoring companies. To do this, Suva has a «Health Protection» department of its own. In the second instance, SECO and specialist organisations assist with its implementation.